Pair of R. dorsinotata; female at top. Another specimen of R. dorsinotata with a slightly damaged caudal fin. Type locality is ‘Mae Nam Huey Bon, kilometer 45 on road from Amphoe ThaWang Pha to Amphoe Chiang Kham, Chiang Rai Province, Thailand’, and this species appears restricted to the Mekong and upper Chao Phraya river basins in northern Thailand and northern Laos. The specimens pictured here were collected from the upper Wang River, a tributary of the Chao Phraya in Thailand , and it’s also known from Nam Ma Oun, Louang Nam Tha (Luang Namtha) province, Laos. Displays a preference for smaller tributaries containing clear, flowing water rather than main river channels, and is apparently abundant in such habitats. The largest specimen known measured 43 mm. Should not prove difficult to keep in a well-maintained set-up, though we recommend aquascaping the tank to resemble a flowing stream or river with a substrate of variably-sized, water-worn rocks, sand, fine gravel and perhaps some small boulders. Since it naturally occurs in pristine habitats it’s likely to prove intolerant to accumulation of organic pollutants and require spotless, well-oxygenated water in order to thrive. A degree of water movement should also be appreciated, and weekly water changes of 30-50% tank volume should be considered routine. Probably feeds mostly on both aquatic and terrestrial invertebrates as with similar members of the genus. In the aquarium it should accept dried foods of a suitable size but daily meals of small live and frozen fare such as Daphnia, bloodworm and suchlike will result in the best colouration and encourage the fish to come into breeding condition. Likely to be peaceful and an ideal resident of the larger, well-furnished community tank. 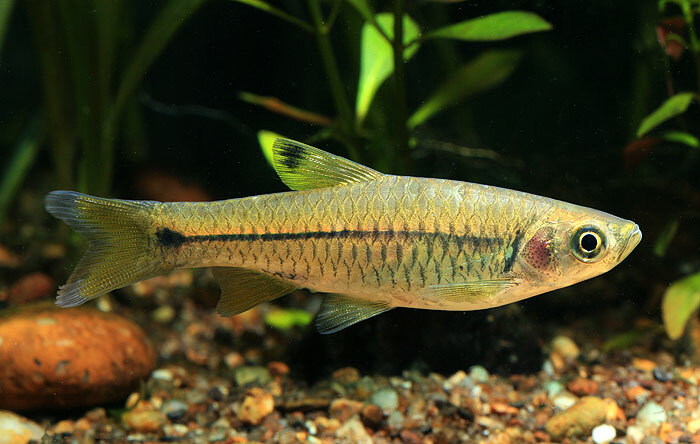 A community based around fish from the Chao Phraya river would also make an interesting project with suitable species available in the hobby including Acantopsis choirorhynchos, Yasuhikotakia sidthimunki, Danio albolineatus, Opsarius pulchellus, Mystacoleucus marginatus, Garra cambodgiensis plus various Homaloptera, Lepidocephalichthys, Schistura and Crossocheilus spp. Rasboras are gregarious fishes and should be maintained in groups of at least six individuals to get the best out of them. They will show better colours, are more confident and display more natural behaviour. Mature females should be noticeably rounder-bellied and probably grow a little larger than males. 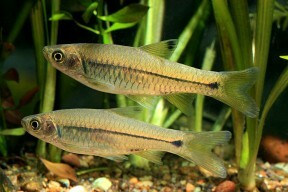 Like most small cyprinids Rasbora spp. are egg-scattering free spawners exhibiting no parental care. When in good condition they will spawn often and in a mature aquarium it’s possible that small numbers of fry may start to appear without intervention. However if you want to maximise yield a more controlled approach is required. The adult group can still be conditioned together but a separate aquarium or container(s) should also be set up and filled with mature water. An air-powered sponge filter or air stone(s) should also be included to provide oxygenation and water movement, or small internal power filter installed and positioned in such a way that the flow is directed down the length of the tank. One or two pairs of conditioned adults should then be introduced to each container. Spawning can often be intiated by adding small amounts of cool water every few hours and feeding small amounts of live and frozen foods. Several spawning events will probably occur before a female is spent of eggs. 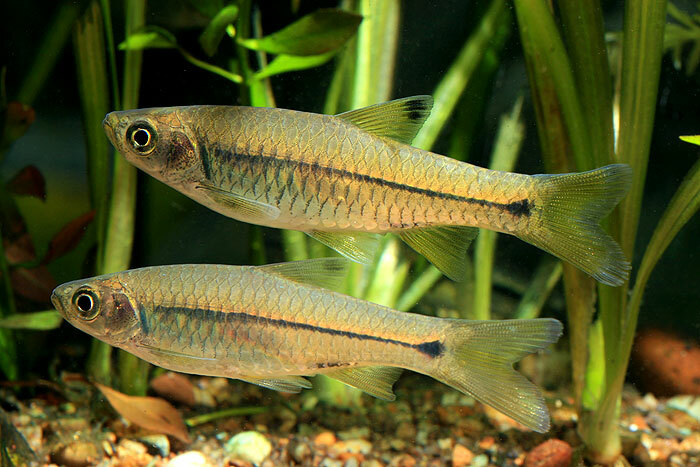 Incubation in Rasbora eggs is temperature-dependant to an extent but usually takes between 18 and 48 hours with the young free-swimming 24 to 48 hours later. Initial food should be Artemia nauplii, microworm, vinegar eels, etc. R. dorsinotata is poorly-documented in the aquarium literature and we’re unsure if it’s been exported for the hobby. It can be told apart from similar-looking species by the following characters: dorsal-fin with a black tip; a black lateral stripe extending from the opercle to posterior half of caudal peduncle, ending in a rounded spot which does not extend onto the caudal-fin; lateral stripe wider anterior to dorsal-fin origin; 26+1-2 lateral line scales; 4½ scales between lateral line and dorsal-fin origin.